Jade Tree Records is one of the best record labels. If you just take a quick scroll through their releases over the past 25 (?!) years, you’ll see that Jade Tree bands simply just make great music. There are probably very few, if any, bands on their roster that I do not like on a pretty basic level. Jade Tree hasn’t been all that active over the past five to six years, but it appears that the label is gearing up to start releasing more and more music these days. 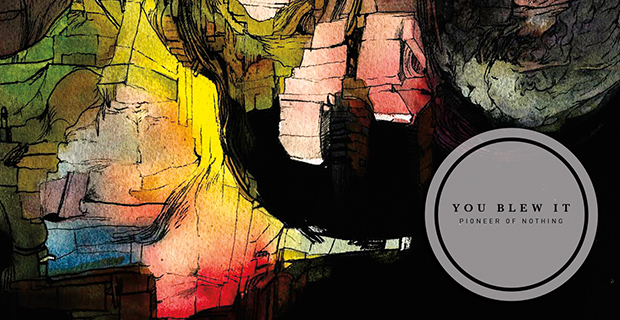 Starting off their 2015 is Florida’s You Blew It!, a band that if you heard them for the first time, you’d probably think “oh they sound like a Jade Tree band.” Well, they are now, and with their new 7-inch, Pioneer of Nothing, the band fits in great with the label, bringing a good set of songs, and despite not stretching their legs too far, You Blew It! have created a sonic work that is best enjoyed in one sitting. Picking up where they left off with 2014’s Keep Doing What You’re Doing, You Blew It! emphasize the quieter sides of that full-length, seemingly looking to create more of a mood, rather than a collection of songs that 7-inches usually tend to be. Opener “Lanai” is the quickest of the bunch, using an intricate mix of guitars, drums, and vocals to create a very unique blend that sets the scope of the 7-inch. While the opener is big, the tracks become decreasingly aggressive, ending with the slow-burner “Your Side,” a melancholy sounding song about being there for someone who doesn’t believe you, or anyone else, actually is. The production on this record really lends itself to the tracks, sounding big when it needs to, but it also knows how to feel stripped down and raw at all the right moments. Pioneer of Nothing brings out a lot of emotions — however, not in the cliché and easy ways. It taps into a less tangible feeling, which I think will have a different effect depending on the state of mind of each person at the time of listening. While I can’t honestly say if that’s a reality–because, hell, I can only speak for myself–I think Pioneer of Nothing does a really interesting job of universally speaking to something, whether that’s a loneliness, happiness, or a general disconnect. The songs by themselves aren’t necessarily anything groundbreaking or overly interesting, but as a whole cohesive record, the songs create a work that I find to be comforting, soothing, and refreshingly familiar. 7-inch EPs are a place for bands to try something new and different, throw a few b-side tracks onto wax for a quick little release, or give you a teaser for the next album they have coming. I think Pioneer of Nothing could have very well been a b-sides 7-inch from You Blew It!, but they take an extra step to try and tease something new, despite the small scale of the release. While I think the mood is there, I’m not sure what kind of staying power it’s going to have. I liked Keep Doing What You’re Doing a lot when it was first released, but when I started this review I forgot that it even came out in 2014. Pioneer of Nothing is a nice listen, but it’s either going to be a grower, or it will just fall by the wayside like a lot of January dump releases. I think it’s going to be the former, but time will really tell. I think one thing is certain: I’m excited to see Jade Tree getting back into the game more, and look forward to what the label has to offer us in the coming year. Posted in Features, News, Reviews Tags: 7-Inch, Emo, florida, indie (genre), jade tree, jade tree records, Keep Doing What You're Doing, pioneer of nothing, punk (genre), You Blew It!